It’s nearly here, the Duffle Coats UK team is getting in the spirit of things. One of the team is attending a Winter Wedding on Boxing day and was having a little trouble deciding what to wear, so we thought we would look at the best Winter Wedding Coats and other styles of coat or jacket that are suitable for weddings. Starting with the most important person on the Wedding day, the bride. There are some incredibly beautiful coats and jackets that enhance and match the bridal gown. From fitted Victorian style which splay out from the waist area, to cropped jackets which are more favourable in the summer months but provide coverage for those who want to cover arms and show off a beautiful sweetheart neck line. Capes are very popular and offer a completely different look to a dress. One of our favourite picks for winter is a fur coat or bolero, they look so glamorous and surround the bride with soft warm fur. These are the perfect pick for the bride on a cold winter day. There are a number of options for mens wedding coats. You can opt for the more formal look with tail coats or something a little more casual with a suit jacket. 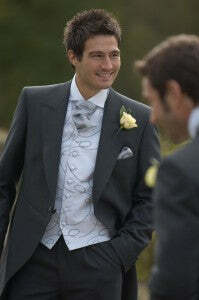 Something that looks incredible for men is a waistcoat which can match with the colour theme of the wedding. Bridesmaid dresses can match the waistcoats and cravats worn by the men, which makes a real nice focal point. For wedding attendees there are numerous coats and jackets for winter weddings. For women, fur coats always look very glamorous and in a simple colour can really enhance an outfit. Men can opt for smart blazers and Pea Coats. A word to the wise, it may look fantastic but a thin winter coat will not keep you warm in a cold church or when the photos are being taken!